The Murphy Cup Regatta returns to the Cooper River on Saturday. Due to the recent rainfall, officials are moving the regatta from the Schuylkill River out of concern for participant safety. More than 30 universities racing over 150 boats will participate in regatta that typically attracts 2,500 athletes and 2,000 spectators. 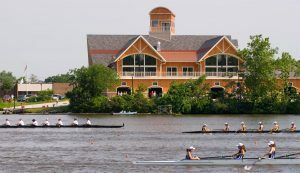 The Cooper River’s Olympic-distance, 2,000-meter straightaway is widely known as one of the best rowing venues in the nation, home to numerous world-class regattas and the Cooper River Boathouse. Spanning more than 346-acres through Collingswood, Haddon Township, Pennsauken and Cherry Hill, Cooper River Park has been Camden County’s gathering spot since it was created by the Works Progress Administration in 1936. Camden County is proud that the Cooper River has emerged as a premier destination for competitive rowing, adding to the diverse family-friendly attractions in our region. Cooper River Park was named a Great Place in New Jersey by the American Planning Association-New Jersey Chapter and continues to be one of the best greenspaces of the Delaware Valley.